Launching new series of buttons and magnets with TELEFREIGHT. CONCEPT: "TELEFREIGHT" which is a concept of teleportation engineering plus the service of an airfreight. In the near future as human population hit 10 billions, owning a car doesn't seem feasble for individuals. Problems such as air polutions emitted from automobiles becoming increasingly uncontrollable, despite heavy greenhouse prevention measures and Kyoto Protocol policies. Traffic congestions and the lack of space also prompted world transportation governing body to have to think of a better solution. Hence, the concept propose: "TELEFREIGHT". 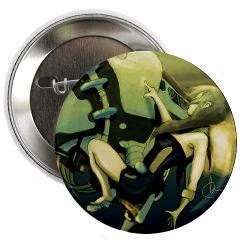 What illustrations and concepts would you like to see being made buttons and magnets? Email me or comment below!